Robert Buderi for Xconomy: When it comes to consumer robotics, iRobot has to be the poster child. It was born 27 years ago out of MIT, founded by legendary roboticist Rodney Brooks, now professor emeritus, and two of his students, Helen Greiner and Colin Angle. Over the years, the company has made many forays into various products—including the My Real Baby doll on the consumer side, but also bomb-sniffing robots for the military. It found its groove, though, in the seemingly ubiquitous Roomba robot vacuum cleaner, its mainstay product. Right now, the Bedford, MA-based company (NASDAQ: IRBT) is on a pretty nice roll. Revenue for the first three quarters of the year soared to $557 million, up 24 percent from $448 million in the same period a year earlier, with profits rising 64 percent to $46 million. IRobot’s stock price is around $68 a share, up from $52 a year ago—though well down from its peak of over $107 per share this summer. But the good times haven’t come easy. A lot of hard lessons have been learned, and the company has come a long way since its original business model—“private mission to the moon, sell the movie rights,” in the words of Angle. 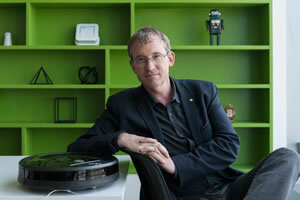 In recent years, iRobot has shifted dramatically. It shed its defense and enterprise-remote presence businesses (the latter included its healthcare telepresence operations) last year to focus on the home market—led by the Roomba—and in 2015 launched a venture groupto help robotics entrepreneurs grow the industry (it’s made about a dozen investments to date). More recently, it has set its sights on how robots can help enable and fulfill the vision of the smart home. Success with this grander vision won’t come easy either. I recently sat down with Angle, who’s been CEO since 1997—and is the only one of the three founders still working at the company. (Greiner and Brooks both have their own startups, drone-maker CyPhy Works and industrial robot company Rethink Robotics, respectively.) Angle says innovation in robotics is like working in “anti-dog years,” meaning what you thought you could do in one year actually takes seven.